I wonder if it’s possible for good artists to be so prolific that they start to be taken for granted – by the critical community, at least. John Godber is just such a prolific artist, with a drama CV so extensive that his website’s ‘playography’ runs well past sixty items – and is at least two years out of date! The extent of his output does not appear to affect either quality or the popularity of his play with audiences, as Wakefield Theatre Royal is close to capacity on a Tuesday night, but it might explain why there has been little fanfare for its debut here, in what has become the home of The John Godber Company. To give a mea culpa, even I did not see fit to include it in my theatre highlights of the month. However, this is an important, powerful and timely play, with a political impact not at all diminished by its personal nature and its intimacy, as a two-hander performed by Godber with his real-life wife, Jane Thornton. After the expressionistic entrance of the actors onto the stage, where they stare briefly at the audience backed by loud noise, the play proper opens by the garden gate of Harry and Dot’s house in the pit village of Upton, where Godber himself was born. Surtitles keep us informed of the date and location, and this is 1984, as the miners, including Harry, face defeat in the strike. From the start, there is anger, frustration and incomprehension at the loss, or rather the willful destruction of a way of life. However, the frame for the play is also set here: all of these powerful emotions will be contained in the fishbowl of Harry and Dot’s marriage, and though they may threaten to spill over the sides or overwhelm those involved, the strength of the partnership somehow always prevents this from happening. Largely, this is because the characters are palpably real. 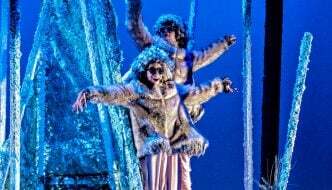 A lesser playwright might have made them heroes or martyrs, but Harry’s stubbornness and Dot’s impetuosity are as infuriating to the audience as they are to each other, though they are forgivable by partner and audience because of the humour and love that underlie them. When Dot is berating Harry for being pig-headed, he turns it round, saying, “That’s what you love me for!” Significantly, Dot does not disagree. Indeed, it seems reasonable to assume that there is a lot of autobiography in both the situation and the relationships. In the programme notes, Godber refers to his origins in a mining family, and to his Dad (who, I understand, was in the audience on the night I attended) and his tendency “to become agitated at the injustice and the demolition of the mining communities”. Likewise, he talks about working with Thornton: “it’s obviously fascinating to work with someone you have spent thirty three years living with, and in this case a look can mean so much.” This is so clearly true in the spontaneity of the dialogue and the interaction between the characters. The humour in the play is of the kind that can’t really be replicated on the page, because it’s all about the chemistry between the two people, but it’s a chemistry that is recognisable to everyone in the audience, who are frequently roaring with laughter at a put-down or self-justification, usually delivered by a stony-faced Harry. While it may seem strange to start the play with a tragedy like the end of the miners’ strike, Godber is the kind of playwright who is primarily concerned with the way in which life goes on after and around such events. And life does go on, initially with the couple trying to make a go of a window-cleaning round, which Harry throws away through stubborn pride to a neighbour who makes a huge success out of it. 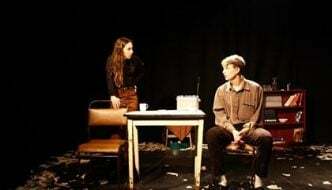 The rest of the first act moves forward through more than a decade in Upton, as Dot tries to keep things together by holding down two jobs, while Harry wallows in self-pity and casual drug use, which almost drives them apart. Even as we progress into the 90s, though, the music that marks each scene change stays resolutely stuck in the 80s, as if to hammer home the point at which all normality and expectation became frozen. However, it soon becomes clear that the progress of the second act is backward through time, as we see how the couple had escaped Upton to run a successful B&B in Bridlington for a few years, before retiring home to worry about their damaged, shiftless family. The device is effective in undercutting some of our assumptions about the characters: for example, we see Harry rejoicing in the gnome collection that adorns the B&B’s garden before we hear him declare with typical stubbornness that he’ll have nothing to do with gnomes. It gives a different angle on the dynamic of the relationship, which in the first act had seemed to be dictated entirely by Harry’s grieving for a lost way of life. Poignant, powerful and political, Shafted! is a play the critics (including me) should have paid more attention to. Audiences, it seems are smarter. Do your best to join them! Shafted! is showing at the Wakefield Theatre Royal until the 18th of April. Visit their website for more information and tickets.